So what’s special about the Ma Tsun-Kuen school of Tai Chi? We train Tai Chi Chuan primarily as a striking or “boxing” art. Although in the early phases of training we use pushes instead of strikes, as these can be better controlled by beginners and are better for learning without stiffness or too much adrenalin. As students of a striking-oriented art we try (!!) to prevent the partner touching us in vulnerable points such as chest, ribs, nose etc. Using Tai Chi principles, of course ;-)…. 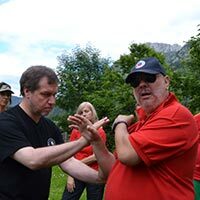 Even when practicing slowly and softly, we never forget that our partner could theoretically use fa jin (sudden issuing of energy) in a strike, joint lock etc. As students progress, they can incorporate chin na (seizing and locking techniques), strikes, throws and other techniques in their pushing hands. But always in a spirit of cooperation and risk-minimizing (see below). This doesn’t mean of course that we – the students of the Ma Tsun-Kuen school – are all very proficient at these methods or that we are hard-boiled fighters. Of course not ???? It’s more a question of what and how we train. The learning path is always long, but thanks to a highly expert master the direction and the training methods are clear and consistent. The forms in Ma Tsun-Kuen Tai Chi Chuan are based on Yang-style techniques but often differ in emphasis and execution. The MTK short form is a jewel. It contains just 13 basic postures which are repeated and practiced symmetrically, i.e. both ‘right-side’ and ‘left-side’. It introduces you to the 8 basic energies-Named – (peng, lü, ji, an, lieh, cai, kou, zhou) are all featured explicitly and clearly. On the one hand the sequence of the form is relatively easy to learn, also for beginners; on the other hand the postures in the form are practiced in a way very close or identical to how they are used in Tui Shou and/or self-defence. This supports the feedback between clear and principle-based Tui Shou and form practice. Even after years of training, this short and seemingly simple form continues to reveal new depths. The long form, based on the 108 Yang form, is similarly structured and transformed. The system also features jian (straight sword) and dao (sabre) forms, a fast form (also symmetrical), a practically oriented san shou partner form and special nei gong (internal Daoist bodywork) methods and sets. When we train pushing hands we train cooperatively: experiencing, researching and concentrating on the principles (separating yin and yang / empty and full, letting techniques from the forms “materialize” as the energies flow). Regarding 2), what martial use (apart from ‘winning a point’) is there in making my partner/opponent move his foot – if, for instance, at the same moment he could hit me in the face? This does not mean that we reject competitions: they can be a useful feedback for learning and a challenge. But the Tui Shou of MTK Tai Chi Chuan is not primarily for competitions. 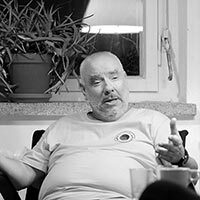 It is relatively unimportant who ‘scores the point’: I’m happy if I manage to do a clear and effective technique on my partner; I’m equally happy if he/she manages to do a clear and effective technique on me! In this way, with martial intent but without ego interference, we both learn more quickly and more deeply. This also radically reduces the risk of injury. As an extension of this attitude, the culture of our school is open and uncomplicated. There is a structured curriculum – but no rigid hierarchy, expensive examinations or dubious contracts. The organization and the teaching are open to all who are willing to follow the path and who bring a friendly mind and a love of the art. 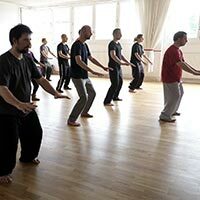 Learning good Tai Chi Chuan is hard enough anyway – we don’t want to make it even harder for those with genuine interest! 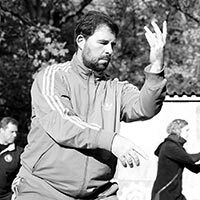 teaches open, style-independent seminars on Tai Chi Chuan principles (Form and Function in Pushing Hands) in several European countries and provides intensive, more specific training for students of the Ma Tsun-Kuen school. 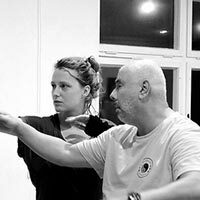 Despite the martial emphasis in Ma Tsun-Kuen Tai Chi Chuan, we do not regard physical self-defence as the ultimate goal. In the long run that is a ‘dead end’ for personal development. Instead, we use the method of Tai Chi martial art as a way of training the mind and the heart as well as the body. We must take the martial art seriously, otherwise we lose focus and depth. But most important is to cultivate health at every level (physical, mental, emotional) and to realize your full potential as a human being.